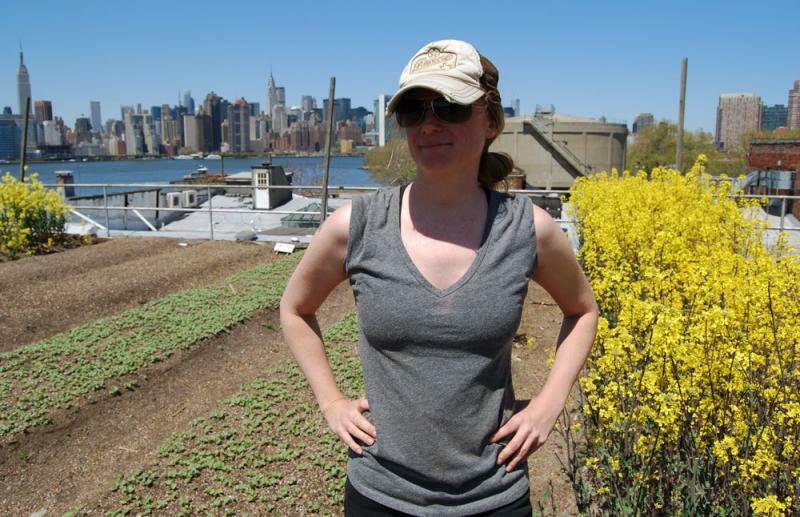 On the Brooklyn rooftop garden she helps maintain, Missouri native Monica Johnson says she's not afraid to show her farm roots. The Moundville, Mo., farm where Johnson’s father grew up, as seen in 1981. 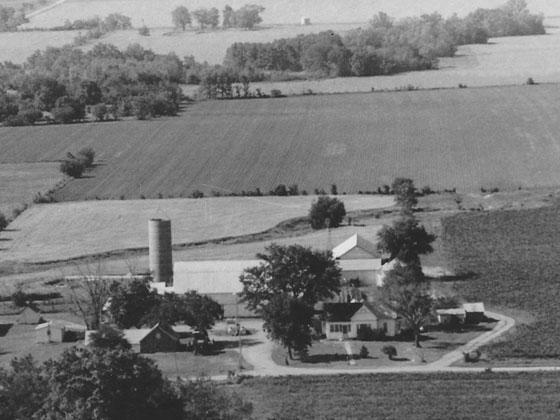 The family sold the farm in the 1990s. 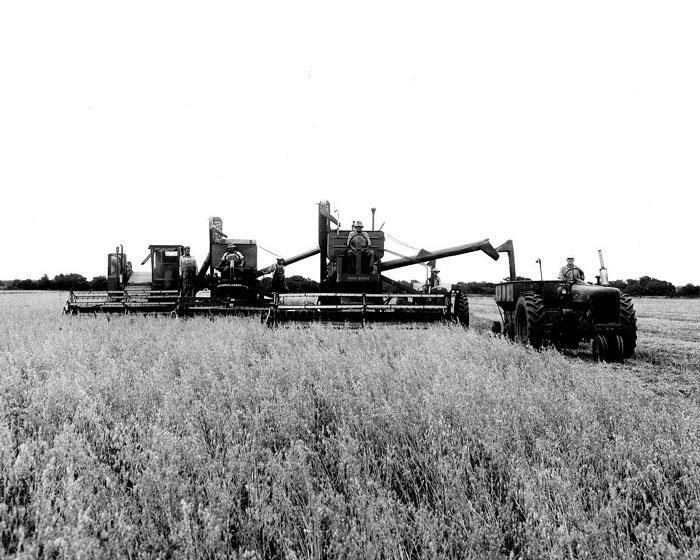 Johnson's grandfather, Raymond Johnson, leads this trio of combines harvesting oats in the 1950s. Luckily Johnson doesn’t have that problem. “Yes, I live in the city. But I'm from Missouri,” she said. “I’m proud of it and I’ll break into my southern accent if I need to. I definitely -- when I need to say that I have farm roots -- I do." Johnson’s farm roots are in Moundville, Mo., a 124-person town near the Missouri-Kansas border. Although she grew up in Missouri’s capitol, Jefferson City, her father Sherril was raised on the family farm, which consisted of a small herd of cattle, 600 acres of soybeans, wheat and corn and 200 acres of timber. The farm is no longer in the family; it was sold in the 1990s because it was no longer profitable. Johnson didn’t think much about it at the time but now thinks losing the farm is incredibly sad. Though this slice of rural life couldn’t be farther from the record stores, coffee shops and Polish bakeries that make up this part of Brooklyn, Johnson’s farm roots are thriving. Besides helping to maintain Eagle Street Rooftop Farm, she’s also sold produce at the farmers market for upstate New York farms, written articles on raw milk and genetically-engineered salmon for the online journal Food Politic and even got a degree that focused on Food Studies at The New School. One of the subjects Johnson studied in school was the wide gulf between rural and urban areas. To that end, Johnson is making a documentary about the Moundville farm. Doing research for the film has also had a side benefit: getting to know her father's family better. She learned, for example, that her dad went to the same one-room Hackberry School where her grandparents first met during a social. At one point in the farm's history, her grandfather kept peacocks before the coyotes got them. Johnson also discovered that most of her family is buried in Welborn Cemetery, a 15-minute walk from where the farm was. Although Johnson is proud of her farm roots, she said any Brooklynite could get connected to agriculture by simply volunteering to work at an urban garden.